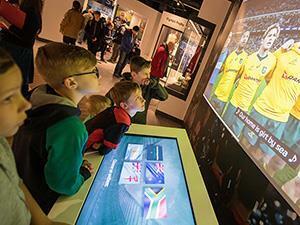 Tours at Twickenham World Rugby Museum & Stadium0208 892 8877work Museum - SportExplore Twickenham Stadium with a rugby expert on a behind the scenes tour and journey through rugby history in the new World Rugby Museum (Feb 2018) telling the story of rugby from around the world, following the game’s history. On a guided stadium tour take a seat in the England dressing room, absorb the atmosphere in the royal box, visit the VIP areas, get a birds eye view from the top of a stand and imagine the roar of the crowd as you run out of the players’ tunnel to pitch side. In the museum explore a glittering array of trophies; take up the challenge of discovering “What Kind of Rugby Player Are You?”; re-live some of rugby’s most memorable moments; see the oldest international rugby jersey and “Choose your own World XV” interactive. The museum displays memorabilia from around the world and from all eras, making it a must visit for all rugby fans. See the What’s On section of the website to see the latest exhibition. Explore Twickenham Stadium with a rugby expert on a behind the scenes tour and journey through rugby history in the new World Rugby Museum (Feb 2018) telling the story of rugby from around the world, following the game’s history. Visit the museum separately or as part of a stadium tour. Tours and Museum closed on Mondays, Sundays after match days, Easter Sunday, Christmas Eve to Boxing Day and New Year's Day. Tours not available on match and event days (see website for dates). It is advisable to call and ensure availability for both the stadium tours and Museum before making your journey. All tours start at The Rugby Store, situated in Twickenham’s south stand. The RFU reserves the right to change details and/or prices without prior notice.